June 3 Hobo with a Shotgun Dundee Theatre, 4952 Dodge St. Call or visit website for current show times $8.50/$6.50 students, seniors, matinees 551.3595, dundeetheatre.com What’s a vagabond to do upon witnessing a town full of corrupt cops, pedophilic Santas and other urban scum? Make it rain justice with his 20-gauge shotgun, of course! Rutger Hauer stars as the eponymous vagrant turned vigilante hero, “delivering justice one shell at a time,” in this campy Canadian action-exploitation flick. 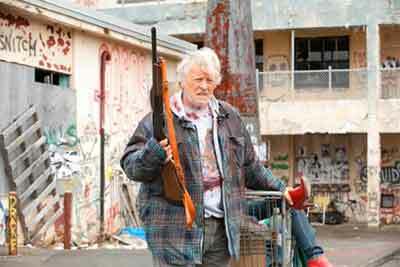 Hobo with a Shotgun is the second full-length feature born of a Grindhouse trailer, following Robert Rodriguez’s 2010 B-movie masterpiece, Machete. Here’s hoping Hobo’s street justice triumphs — and that we’ll soon see full-lengths of other hilarious Grindhouse trailers like Werewolf Women of the SS, Thanksgiving, and my favorite, Don’t.